Polycystic Ovarian Syndrome (PCOS) is a complex hormonal and reproductive disorder that affects over seven million women in the United States and 1-in-10 women worldwide. PCOS is also a leading cause of infertility in many women and though there has been increased awareness over the past decade, almost 50% of the women who are suffering from PCOS are estimated to be undiagnosed. What should women be aware of regarding PCOS? There are four key areas that women should pay close attention to in order to request more testing for this disorder. Hair and Skin Issues – Often women with PCOS often have Hirsutism. Hirsutism is the growth of coarse, dark hair above the lip and on the chin, chest, abdomen, and back. The hair growth is caused by an increased level of male hormones (androgens). Although all women produce androgens, increased levels of androgens can lead to Hirsutism. If you are finding that you have unusual growth of hair in these areas, then it is best to mention it to your doctor and ask about PCOS. In addition to hair growth, PCOS is often also associated with premature balding (typically in the front of the head) for women and severe skin issues. Irregular Cycles – PCOS is a hormonal imbalance that can cause the ovaries not to work. In most cases, the ovaries become enlarged and appear covered with tiny, fluid-filled cysts. Symptoms include irregular cycles including no period, irregular periods or ovulation issues. Often with PCOS, women will have extremely long cycles due to ovulation issues. If you are experiencing any irregularity in your cycle, you should speak to your doctor. Infertility – Fertility problems in women with PCOS result from the absence of ovulation (anovulation). One way to determine if you are having issues with anovulation is to track your cycle with a chart each month to determine if you are ovulating. Essentially, PCOS is an endocrine disorder that causes major issues with ovulation making it extremely difficult to track your cycle and conceive. If you know that are having ovulation issues, you could have PCOS and should speak to your doctor and bring your charts if you are able to track it. Depression and Emotional Issues – Infertility alone can cause emotional issues and depression because women feel their body is just “not working.” Additionally, many women with PCOS experience swings in blood sugar levels and increased levels of androgens (male hormones) which can cause mood fluctuations. Increased levels of androgens can lead to aggression, irritability and anxiety. Also, odd hair growth coupled with skin issues and periods of baldness can cause major issues with appearance and self-esteem for women. If you are experiencing erratic moods with Infertility, Irregular cycles or Hair/Skin issues, you could have the perfect storm symptoms of PCOS. 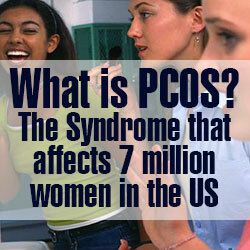 PCOS can have a major effect on women in several areas as shown by the above. If you suspect that you may have PCOS, visit your primary care Doctor or a Fertility Specialist and get the testing done that can lead you on a road of recovery. You don’t need to suffer and there are several options and support groups for women who suffer from PCOS. You are not alone.